The coordinated was very attentive. He made sure as to who I was with and what my whereabouts were. I felt very comfortable and safe throughout my stay. At the program: Volunteering at the hospital gave me a whole bunch of trauma related surprises on a daily basis. 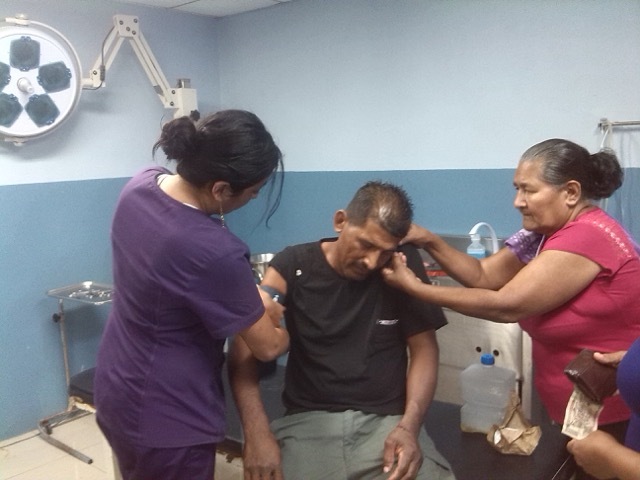 At the clinic I was treating infected wounds, diabetic ulcers, taking out sutures, ear irrigations, and abbess draining. Seeing such a wide variety of patients was defiantly mind blowing. At the hospital, the Emergency department was defiantly busy and I had the opportunity to learn how to suture, treat and manage gunshot wounds, fractures, and triage. I was fortunate enough to visit labor and delivery for a small rotation and was allowed to participate in a delivery. Also, I found a lot of the interns to be around my age and got along with them very well. I even found myself hanging out with them outside of the hospital. A lot of the interns spoke English as well which I saw to be helpful to the other volunteers who did not speak Spanish. There was one weekend where we were a part of a medical brigade in Sambo Creek. This was another great experience where we were providing care to people who could not make it out to the city. Here I assisted dentists in tooth extractions, and again found everyone to be very open to teaching in informative. At the accommodation: I felt very at home since the day I came here, as if I were an extended part of the family. About the country: Not that it was a major surprise, but the community here is very loving and welcoming. At the program: The lack of funding and supplies for medical treatment. At the accommodation: Everything went pretty smoothly. The country: Again, lack of government funding for social services. Donations: Anything helps really. Gloves, sterile gauze, syringes, etc. a.- Be open minded! Things may not be on time or run as smoothly as planed so just go with the flow. c.- Plan weekend trips ahead of time. Theres a lot to do and time goes by quickly. d.- Have a budget. Although some things are cheaper here, money can go by VERY fast especially if you're having fun. This trip was absolutely far beyond what I would have imagined. My experience was very hands on and I learned everything from cast molding to sutures. The staff in the hospital was very helpful. I would highly recommend knowing at least some Spanish lessons. I felt right at home with my home stay. The meals were different but defiantly tasty. There weren’t any moments were I felt unsafe or uncared for. Program: Doing patient follow ups and seeing how grateful they were for my service in their country. Country: Utila is the craziest, most fun little island and having a mini vacation where I learned how to scuba dive in one of the best reefs in the world was the best experience! 8.- How was the ABV USA support prior traveling? Communication (Phone/emails/Online chat): Very helpful. I felt well prepared for my trip. There were plenty of emails about what to bring, where I would be staying, who I would be staying with, etc. While I was here, the coordinators from home were in contact with me in regards to how the trip was going. 10 – Can you tell us how did you find or know about A Broader View?I was interested in finding some medical volunteer experience abroad in order to apply for a program that I was interested in. When conducting a Google search, I found a few different organizations that could offer that opportunity. I choose ABV based on its nonprofit status, positive reviews, and how it fit within my budget.